Selfies have become inescapable over the last few months, and with their ubiquity has come variations concerning among others farmers and bottoms. 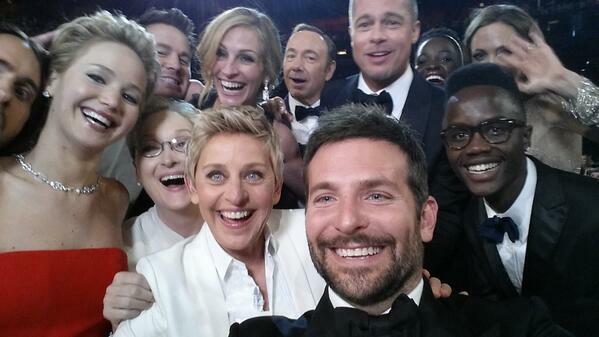 Now, the recent trend for selfies involving groups of people has spawned its own word. Usies (pronounced uss-ees) has been coined for the images which have been becoming increasingly prevalent since the famous Ellen DeGeneres shot of Hollywood royalty at the Oscars earlier this year. The word was first used last year but is only now coming into consciousness and wasn’t really known when the Oscars took place. However the growing number of shared selfies now means that the need for the word is greater, hence its eventual emergence into more regular usage. “Usies are a growing trend that I think have far more social value than selfies,” said Michal Ann Strahilevitz, a professor of marketing at Golden Gate University in San Francisco. I actually think Professor Strahilevitz has a point. When I was writing about selfie being named word of the year last year, I was slightly despondent as I felt it described a slightly fractured and narcisstic society, obsessed with self at the cost of community. While self-promotion is still at the heart of the usie, it is more about the people you are pictured with, the group rather than the individual. Is society moving towards greater unity and community again, rather than an obsession with self? The emergence of a new word is clearly flimsy evidence on which to base such an assertion, but if society does feel more cohesive and joined up in a couple of years’ time, it might be interesting to look back and see whether this linguistic trend really did mark a turning point.